Over the years I’ve periodically attempted to “crack” the secret of cracker making. I’ve had some degree of success with rye crispbreads and later olive oil seed crackers. The first was a rye sort of oatcake using spent rye sourdough starter and the latter a very loose modification of the Tortas de Aceite recipe posted by Sandra (from Please Pass the Recipe) who in turn modified the recipe from yet another blog, Kellie’s Food to Glow. But then, I gave up and didn’t explore the world of crackers any further. With the holiday season, I thought it worth having another go at experimentation. 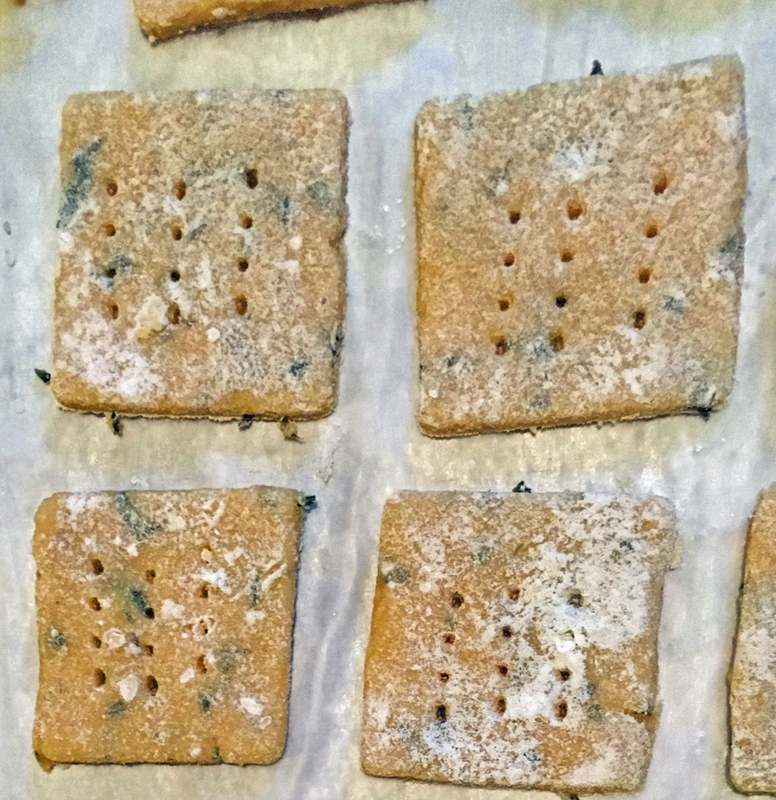 At first, I tried making barley flour crackers with rosemary. 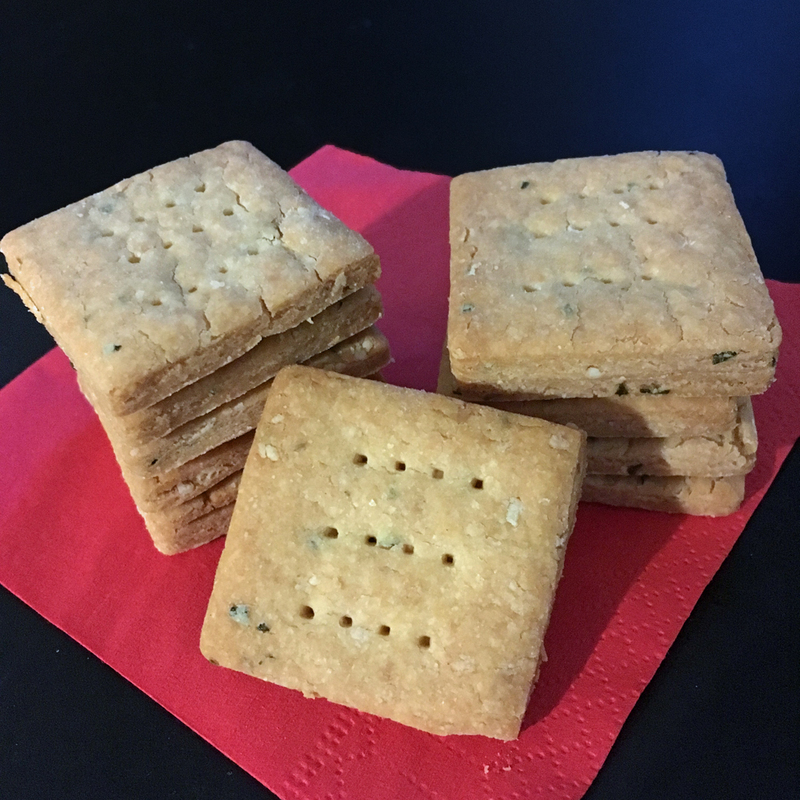 They had a fabulous flavour and were dry, but they were a bit tough and hard – possibly gluten causing problems – and more like hardtack than cracker. Second go around, I substituted chickpea flour for the barley and changed a few other ingredients around. Chickpea flour (also known as gram flour, besan or ρεβυθάλευρο in Greek) like oat flour and chestnut flour, has no gluten. First attempt – okay, but still a little hard. Second, third and fourth time tweaking the ingredients. Although not perfect, those first experimental crackers were edible, but I knew I could do better. When the bag of chickpea flour was nearly finished, I managed to produce a great tasting cracker with the right amount of crispness and a flaky texture. Although, following the maxim ‘there is always room for improvement’, the crackers could have been a bit thinner. It didn’t stop my hoards from gobbling them up. More ρεβυθάλευρο is on the shopping list. A great cheesy cracker to accompany pâtés or cured meats – or snack on their own. The flavour combination reminds me a little of the classic Tuscan cecina. Preheat your oven to 160 degrees C (fan assisted). Put the flours, salt and baking powder into a bowl. Strip the needles from the rosemary sprigs and chop finely. Add this to the dry flour mixture. Mix until well blended. Cut the butter into small pieces then add to the flour mixture. Rub the butter into the flour until it becomes crumbly. Add water, one Tablespoon at a time, until the dough comes together. Then knead the dough. It should be pliable and not crumbly. Wrap in clingfilm and let it rest for a while. Roll the dough out on a floured surface to form a fairly thin oblong, sprinkle with a little water (to keep it pliable) and then add about a quarter of the cheese (which will adhere the the slightly damp dough). Fold the dough top and bottom into the middle, slightly overlapping and sealing the edges. Turn the dough and repeat the rolling, sprinkling water, adding cheese, folding, turning and rolling three more times. On the final roll, the dough should be about 2-3mm thick (mine were at least 1mm thicker). Cut into squares or form shapes with a biscuit cutter. Place on a baking tray and prick the crackers with the tines of a fork. Bake for about 15-20 minutes (depending on thickness) when they begin to turn golden. Remove from the oven and cintinue to let them crisp and completely cool on the baking tray. Store in a tin. These look great. I have no idea why, but it had never occurred to me to try to make crackers. This looks a good place to start. Thanks. I don’t know why I am an determined to get those crackers just right. It is so much easier to simply go out and buy a packet. Satisfaction might be the motivation – something conquered. Still working on it, though. Oatcake are much simpler! Got the idea from a recipe in a 1950s cookbook. It does make them crispier. Your crackers look very good to me. I make crispbread on occasion and use kikärtsmjöl (chickpea flower) as the main ingredient. But, I’ve not made crackers like yours with it. I’ll just have to give these a try or two. Thanks for perfecting your cracker for us Deb. Thanks Ron, but I am merely a novice at cracker making. There is certainly a lot of room for improvement. What I liked about these crackers was the layering effect of the cheese . I think it made them a bit crunchier.